As a popular winter sports locale, the Pocono Mountains offer a variety of winter adventures including dog sledding. You will not find another experience here like it! 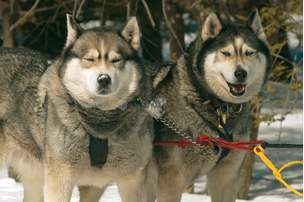 Jump on the sled and mush your way along trails handling a team of Siberian Husky Dogs. It is sure to be something that you’ll be talking about after the last run of the day. Find fun for the whole family on the winter slopes!